Did Brad Pitt’s Drinking End His Marriage? The split between the famous Hollywood couple Brad Pitt and Angelina Jolie last fall was surprising for many fans as the two had been together for more than a decade. Pitt has opened up about some of the issues that led to their divorce as well as his decision to get sober following the split. He admits that the collapse of their relationship was “self-inflicted” and he chose to quit his alcohol use in order to get his life back together. The event that ultimately ended their relationship occurred back in September after a reported altercation between Pitt and their fifteen year old son Maddox which led to an FBI and LA child services investigation that he was eventually cleared of. The altercation took place on a private plane and an anonymous call was made to the authorities which triggered the investigation. Soon after this incident, Jolie chose to file for divorce and the two became embroiled in a custody battle for several months. Together they have six children, three of whom are adopted and initially Jolie fought for sole custody but the two decided to work out a visitation agreement privately. Pitt admits that their divorce has caused him to go through a period of grief but it also helped him quit drinking, a problem that had been with him for much of his life. He said that he couldn’t remember a day since he got out of college that he wasn’t drinking or using some type of substance. He quit all forms of substance abuse and has been sober for more than six months now. He revealed that his drinking may have been a factor in the demise of his marriage admitting that it became a problem for him. Booze became a way for him to run from his feelings and he is glad to finally step away from his abuse and be in touch with his emotions again. Since his marriage ended and he became sober, Brad Pitt has had to deal with more difficult sides of himself that he may have been escaping through alcohol and drugs. He has come to terms with some of his emotional pain and learned to accept it as a part of life, something that he was been able to do with the help of therapy. Pitt has really enjoyed the process of therapy to help him connect with himself and work on introspection. His divorce has also helped him realize how important family is in the greater picture and he hopes to be a better father to his children instead of letting work interfere with relationships as he might have in the past. He hopes to pass on more sensitivity and ability to discuss emotions than he had in his own family, where strength and hiding an inner struggle was valued more than being vulnerable. He also hopes to keep his family together as much as possible so that the children can handle the aftermath of the divorce without being too jarred by the change. 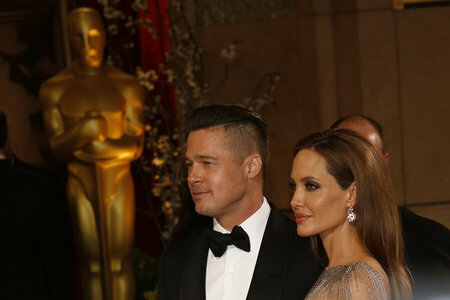 The relationship between Brad Pitt and Angelina Jolie began around the time that they filmed “Mr. and Mrs. Smith” together in 2004. At that point Pitt was still married to Jennifer Aniston but admitted that he fell in love with Jolie while on the set of the film. The following year Pitt and Aniston divorced after five years of marriage although Pitt denied any relationship between he and Jolie for some time. In 2006 Jolie became pregnant and the two became one of Hollywood’s most popular couples. After the birth of Shiloh, their first child together, they later adopted Pax from Vietnam. Their children were given the surname Jolie-Pitt though the couple had not yet married. Pitt explained that they wouldn’t marry until everyone in the country was legally allowed to do so. In 2008 the couple had twins, Knox and Vivienne and later in 2012 they finally announced their engagement, unable to wait any longer because their children wanted their parents to be married. Their marriage took place in 2014 in Correns, France with all six of their children playing roles in the ceremony. In the fall of 2016, after only two years of marriage the couple divorced. After more than a decade together, Jolie and Pitt have gone their separate ways. Pitt’s main focus right now is on his family and being there for his kids but rumors suggest that he is now ready to date again. Even though Jolie blames Pitt and his drinking habit for their divorce, the former couple have resolved many of their issues and are trying to remain amicable for the sake of their children. Brad Pitt is now just trying to start his life over as a newly sober, single man.